Vice President Yemi Osinbajo has led delegates to the All Progressives Congress (APC) mega rally holding in Osun State. The rally which is being held at the state capital Osogbo, the state capital is to woo the residents for votes towards the forthcoming governorship election slated to hold on September 22, 2018. 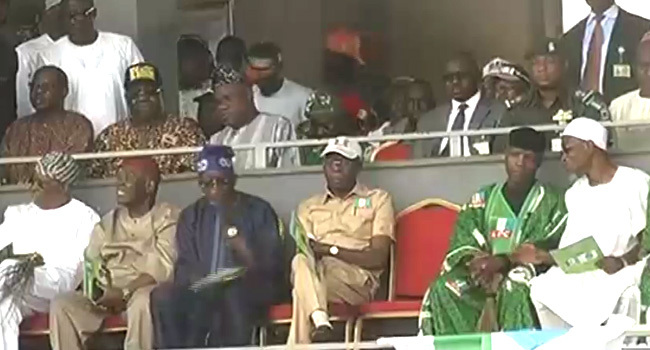 In attendance at the rally is the National Leader Bola Tinubu, National Chairman of the party, Adams Oshohmole; incoming governor of Ekiti State, Kayode Fayemi; Kano State governor, Abdullahi Ganduje; Osun State Governor Rauf Aregbesola; party candidate Gboyega Oyetola; Ondo State Governor, Rotimi Akeredolu; Oyo State Governor, Abiola Ajimobi; Ogun State Governor, Ibikunle Amosun, amongst others. Earlier, the Social Democratic Party’s (SDP) candidate, Iyiola Omisore had canvassed for votes from residents of the state. He urged the residents to avoid vote buying and come out to vote for him. For the September 22, governorship election, 48 candidates from various political parties will be contesting for one seat. The candidates include the APC candidate Adegboyega Oyetola, Ademola Adeleke of the Peoples Democratic Party, (PDP), Iyiola Omisore of the SDP, Action Democratic Party (ADP) candidate, Adeoti Olalekan, among others.